An impactful business card is a crucial part of making the right first impression–and making sure that impressions lasts. The design should represent a company’s identity, to remind customers why you stand out among the rest. For the George’s Garage Door Services business card design, we wanted to utilize the various textures featured in their garage doors. As a result, customers would get a feel for the products GGDS offers and remember GGDS for their garage door needs. The business cards were part of a larger marketing initiative. To keep the brand cohesive throughout the materials, we utilized the color scheme and textures developed specifically for GGDS. For the business cards, we mirrored the upward motion depicted in their logo to tie the imagery together. 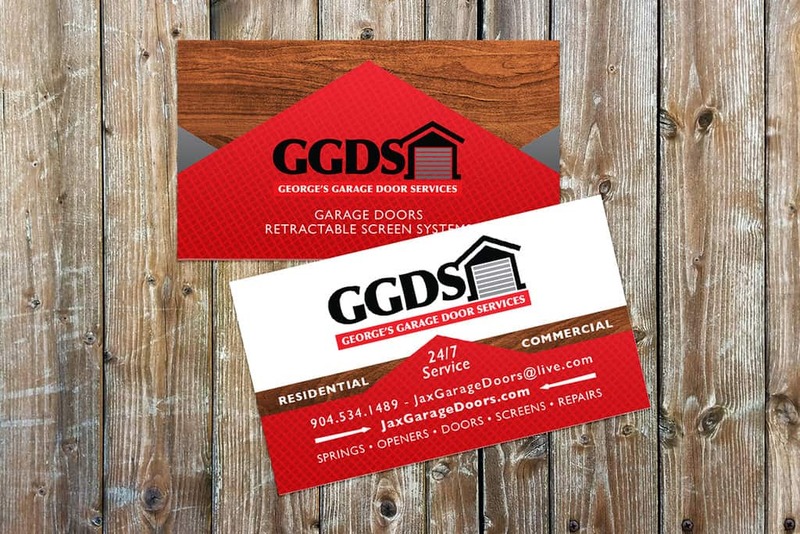 The George’s Garage Door Services business card design was accompanied by the design of a brochure, banner, and website. George’s Garage Door Services has been installing and servicing garage doors in Northeast Florida for over 20 years. They are committed to providing fast quality service for all residential and commercial garage doors.